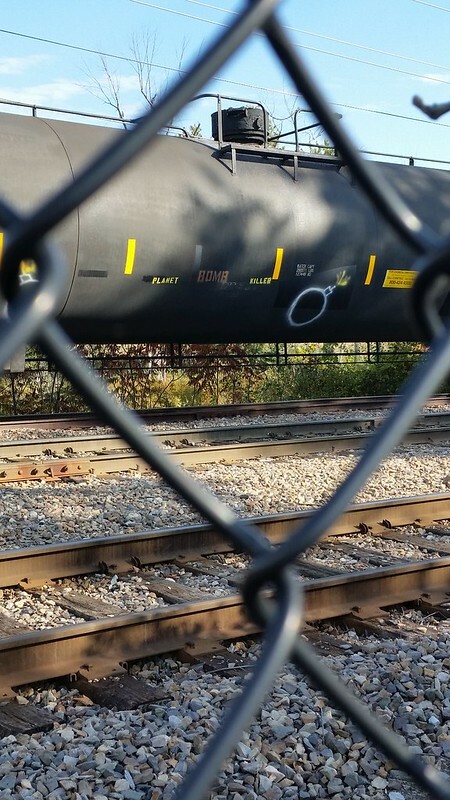 An oil tank on a train track seen through a chainlink fence. I had a photo without the chainlink fence but I felt the fence addd a layer to the photo that was interesting. The presence of the fence in the photo kept the viewer removed as such a fence would do in real life. The tanker itself was curious in its stark blackness and yellow rectangles. It sat quietly on the train tracks, but what drew me to take the photograph was, of course, the graffiti. The lit bomb and stencilled words, "Bomb" and "Planet Killer" sitting on the tanker spoke loudly about graffiti as a form of resistance. The person did not try to destroy the tanker but has made it into a traveling political statement about our self-destructive dependence on oil.